Each year, BAFTA receives a small number of London Marathon places thanks to our membership of the Charities Forum, the group of charities benefiting from the patronage of TRH The Duke or Duchess of Cambridge or Prince Harry. 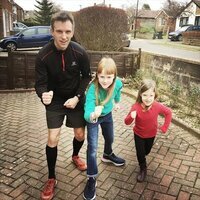 This year our fantastic runners are fundraising for BAFTA Kids. Check out their stories below, and find each of their fundraising pages here. Al has worked in film sound for over 20 years and has been a member of BAFTA for 6 years. I feel the Children’s Hospice screenings BAFTA put on are something very special, helping the children and their families create some exciting and enjoyable memories in what is a difficult time. This will be my first marathon after having been a runner and triathlete for a number of years. I’m really looking forward to it and have been bowled over at the generous support I’ve received from colleagues, friends and family from the moment I told them the cause for which I was running. Lucas is Senior Vice President of Development at Working Title Films and has been a BAFTA member for 9 years. It was only when I volunteered that I began to learn about BAFTA’s fundraising activities. Raising funds for BAFTA Kids has been a pleasure and a delight; screening programs for children and families struggling with illness, through to educating and inspiring children from backgrounds where film feels an impossible career pursuit, couldn’t be more motivating or fulfilling. I moved to London in my early 20’s from Australia, with no family here, and knowing no one in the business. If I can do it, I would like to think anyone can! I’m thrilled to help spread that word. As well as complete a marathon before turning 40! David has worked in television motion graphic design for over 18 years and has been a member of BAFTA for 17 years. 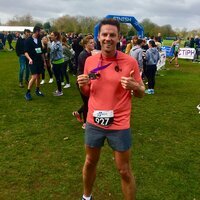 I ran the London Marathon in 2012 and am excited to be running again this year for BAFTA Kids. It's a fantastic charity and I'm keen to help children with life limiting conditions to share the same enjoyment that I get from film. I work in TV as a freelance motion graphics designer. Most lunchtimes you'll find me out trying to squeeze in a quick 10k. I'm working hard both to improve my pace and to reach my fundraising target! Charlotte is a member of staff here at BAFTA, working as part of the Albert sustainability initiative. 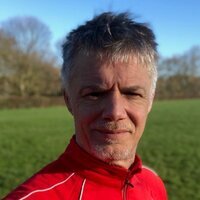 I naively thought that as I could comfortably run 10 miles that running a marathon would be fine, training has proved that 10 is the sweet spot and anything more is hard! BAFTA Kids is a great charity- as someone who was always discouraged from taking arts subjects and then went onto study Fine Art, I think anything which encourages education in the arts is important. Christian is the founder of Playsport Games and creator of Motorsport Manager, he has been a BAFTA member for 2 years. Our Red Carpet Experience at the Children's Awards, which offers children aged 7-14 the chance to engage in a fun filled day of activities, with interactive masterclasses and competitions, learning how their favourite television programmes are made, and finishing off with a visit to the real red carpet at the annual Children's Awards, where the children can welcome the guests and meet their favourite celebrities. The Big Schools Day at Alexandra Palace, where 1000 Year 5, 6 and 7 school children can experience a magical day of fun and learning, including special masterclasses, music, stunts, live discussions and competitions to explore the various creative roles within children’s media. A series of special children’s hospice screenings throughout the UK for children with life-limiting conditions and their families, offering them the opportunity to spend quality time together, away from the stresses placed on them as a result of their child's illness, in a safe space where they can feel comfortable, without any concern that their presence might disrupt other cinema goers. BAFTA hopes it can give children and their families very special experiences and treasured memories that they otherwise might not have been able to access. We are grateful to anyone who donated to our 2018 runners and enormously grateful to the runners themselves. In 2018, Jez Harris, Stan McLeod, Julie Spensley-Corfield, Dean Searley, and Anthony Quinn ran the Virgin Money London Marathon on 22 April, raising just under £8000 between them for BAFTA.